Though the non-flavor-related driving themes of my Strawman review still more or less hold true for Iceman (for the money you’ll pay to buy it you’d be better off supporting a smaller craft outfit), I thought I’d get a review on the books for practice and for the sake of being comprehensive. 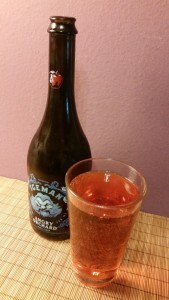 Iceman is dramatic, a bold clear orange in color and 10% ABV. Taking its cues from ice ciders, its aroma is sweet, sweet, sweet, like candy-dipped apples, and the flavor follows with more strong sugary notes, caramel and toffee over the intensity of the tart apple. 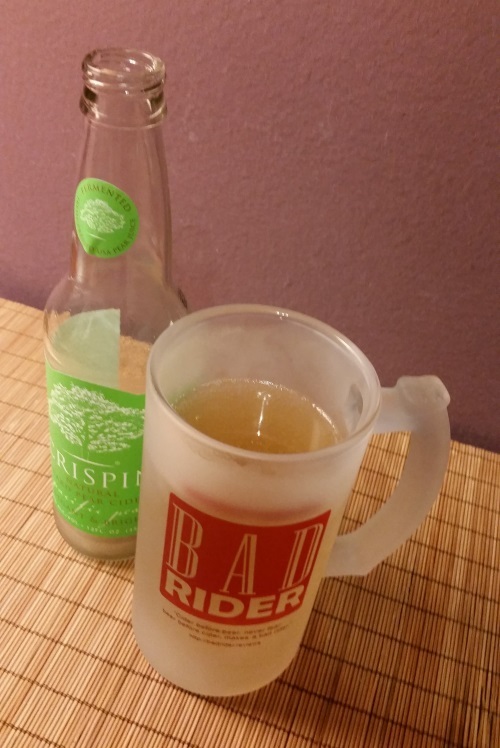 Even for my sweet tooth, Iceman is on the verge of being too much like ice ciders and ice wines, generally consumed in small amounts, a sip at a time. It’s a big taste. On the up side, while it’s pricey for cider (especially for commercially produced, widely-available cider), Iceman is more of a decent deal for someone who wants to try ice cider but doesn’t want to shell out $$$$ for a tiny bottle of the stuff. Locate some Iceman for yourself here. Posted in Cider. Tagged 750mL, angry orchard, cider house collection, iceman. But seriously what is that dude on the bottle’s DEAL? So. Yeah. Peanut butter beer. That’s a thing. When it comes down to it, I know this beer isn’t that weird. I’ve read news stories about American brewers making beers out of Count Chocula and Boo Berry cereals. A little nut butter? That’s nothing, especially since I love peanut butter. I might even consider peanut butter cups, which Dead Frog’s label so clearly evoke, the greatest candy of our generation. And yet, man. Even taking a sip of this beer felt like a hurdle. 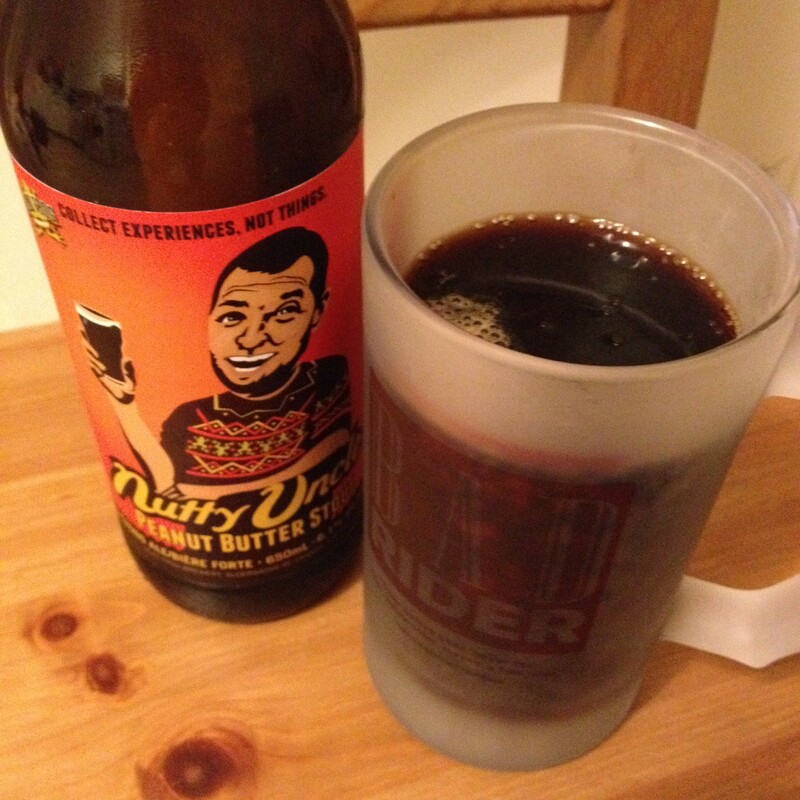 I took extra photos of my mug, I Skyped people, I sniffed the beer over and over, trying to decide whether I could smell peanuts or just the usual mix of malts and sundry common to your average B.C. stout. Nutty Uncle is less peanut butter and more roasted nuts, with a certain smokiness to it on the first sips that I never quite shook off. 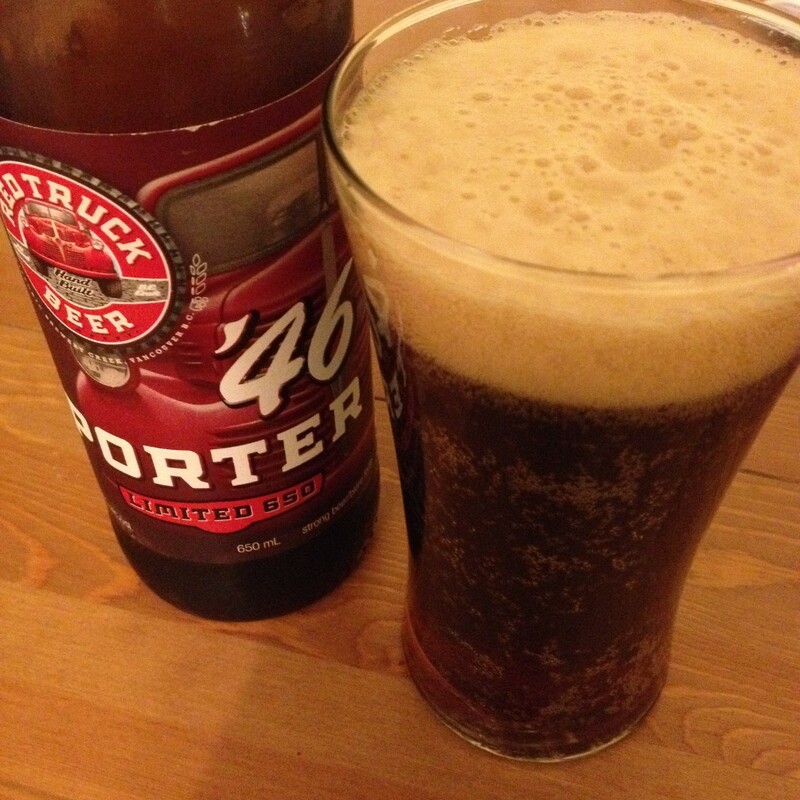 As befits a stout, there are also notes of chocolate (coffee, as the brewery claims, not so much) though I wish they’d been milkier and rounder, the way Parallel 49’s pumpkin and milk chocolate porter manages. That’s chocolate in practice, where Nutty Uncle is chocolate in theory. It’s sweet, but not incredibly — to the point where I almost wondered if more sugar wouldn’t have been worth it. Overall, a peanut butter cup. As much as you can with a beer. Yeah, OK, it’s weird. It’s totally weird. Super freaking weird. There is a picture of a dude who looks like a low budget Adam Sandler on the front of the bottle — I don’t know what I was expecting! Props to you for inventiveness, Dead Frog. But to be honest now I mostly want a real peanut butter cup. But then again, when does one not? Posted in Beer. Tagged 650mL, Aldergrove, Dead Frog Brewery, weird beer hall of fame. I found this cider while out with some coworkers for a sort of “we survived the last few months” celebratory happy hour, and since I haven’t seen cans or kegs of it in the stores I tend to frequent I figured I’d try to jot down some notes without being too blatantly rude to my fellow happy-hour-goers. It’s a classic clear gold, 6.9% ABV, and the aroma is disarming at first — a mild, sweet, pretty straightforward dessert-apple smell. So when I took a sip, the wallop of powerful vinegar sourness came as a major surprise. Sure enough, when I took another sniff I could get a hint of the vinegar under the apples, though that might have been a contribution from the long finish of the cider. It’s not a sweet vinegar taste, either. Acidic, tannic, bitter — it’s been a long time since I couldn’t prevent myself from making a face when I tasted an alcoholic drink. In the words of Ian Fleming, once is an accident, twice is coincidence, and three times is enemy action. Before trying Troy’s MCMXIII I might have thought I somehow got a can that soured on the shelf; I still haven’t entirely ruled the idea out given that they’re both unfiltered varieties, but I’m also starting to consider that there’s an actual market out there for people who really want to drink cider vinegar with bitters. 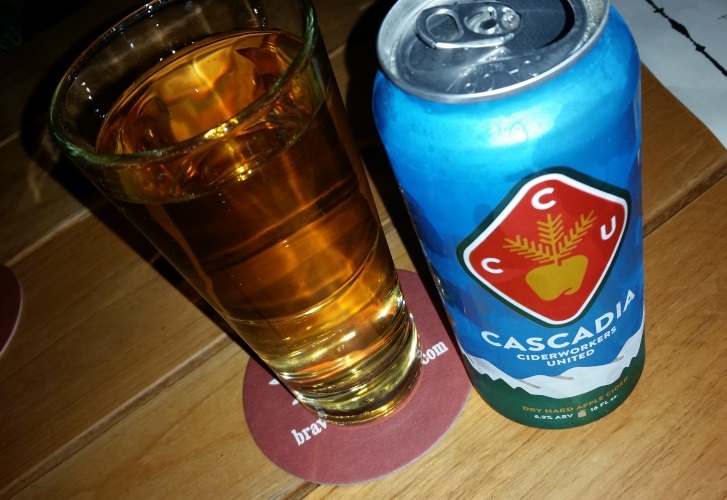 CCU doesn’t have a cider finder, but you can check them out on Facebook and keep an eye out for them on tap around the Pacific Northwest and in cans more broadly distributed. Posted in Cider. Tagged cascadia ciderworkers united, dry. Shoutout to the B.C. Liquor Store employee who told me to get this one chilled, but not too cold. You get a much better sense of the yeast that way. 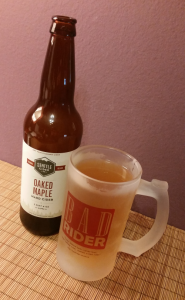 So, yeah, I’m not over strong beer after all, but drinking Bad Tattoo’s new limited offering reminded me it’s not so much the alcohol content that counts as how you use it. And Bad Tattoo, I’m coming to realize, really knows what it’s up to. What’s most surprising about this beer is how sweet and boozy it smells — and how normal it actually tastes. So many of the strong Belgians I’ve tasted lately have this almost rotten fruit flavour to them, but Dia de Los Muertos Cerveza Fuerte is concerned with other flavours. Dark and dense, it’s another of those hearty bread-style beers, all rye toast and nuts. Despite the smell, I didn’t find it particularly sweet — nary a vanilla or caramel tone here. This is a savoury beer for sure. According to the bottle copy these bad boys have more than a full pound of malt per 750 mL and two strains of yeast. Of the two, it’s the yeast that stood out most for me, and tipped the beer from good to fascinating. To call a beer fermented is to state the obvious, but you can taste it here in a way that I’ve not experienced often, similar to the notes of a good sushi-joint soy sauce or a well-crafted kombucha. 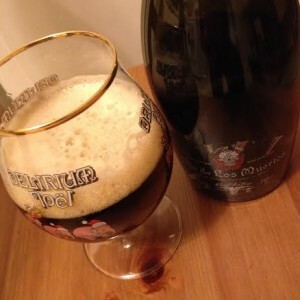 While it’s got some fizz to it, this is one heavy beer, best drunk very slowly over the course of the evening while making a slow slide from couch to floor (just because this beer isn’t upfront about its alcohol content, doesn’t mean it’s not there). Or you could share it with friends, I suppose, but since this is an extremely limited 1,200 bottle run you’ve got a built-in excuse to horde it all to yourself. On a final quick and shallow note, I’ve bagged on Bad Tattoo a bit for its regular series bottle designs, but these black, long-necked, wax-dipped bottles are things of beauty. I’m tempted to stick a candle in the empty and use the light to illuminate a garret as I write gothic novels. 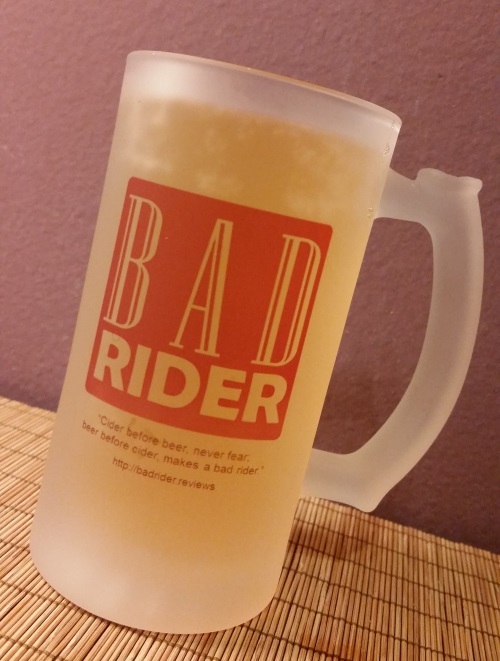 *Riders, do I dare? I considered a bottle at the shop today but I am mad skeptical about anything that is not wine but feels the need to identify itself as such. Posted in Beer. Tagged 750mL, Bad Tattoo Brewing Co., Penticton. Through fondness and lucky timing, I’m developing a reputation at my local liquor store for being the keg-killer of their dedicated cider tap — I killed the last two they had, and we’ll see if I can make it three for three with Portland Cider Company’s Hop’rageous. Hop’rageous is 6.8% ABV, a clear gold in color, and brings serious citrus and bitter notes in both aroma and flavor — not surprising since Portland Cider Company says it’s not only made with Citra hops but that they also added in orange peel. No doubt thanks to the orange peel, for once I can pick out that there is a particular type of citrus taste instead of being unable to pin it down to anything in particular. The orange comes through more in the aroma, the bitterness more in the flavor — yet neither the orange nor the bitterness are overpowering, and the cider stays pretty light and fresh overall. Not overly tart or acidic or sweet, but well-balanced. I still like it less than, say, their Kinda Dry, but that’s just a matter of personal bias against hops in general. For a hopped cider, it’s pretty decent. Hop’rageous is currently only available on draft according to Portland Cider Company’s website, but you can look for some near you. Posted in Cider. Tagged hop'rageous, hopped ciders, portland cider.